Even Scorsese might not have immediately recognized what he’d accomplished, because he’d just lived through a complicated decade. He’d poured his soul into 1980’s Raging Bull, which hadn’t done well enough at the box office to change Hollywood’s perception of him as an arty, uncommercial filmmaker. So he spent the next few years making smaller pictures like The King Of Comedy and After Hours, and signing on to do more mainstream, less personal work like The Color Of Money, or the occasional TV and music-video assignment, in order to regain the clout to direct one of his passion projects, The Last Temptation Of Christ. But Last Temptation’s controversies and compromises left Scorsese exhausted again, making Goodfellas seem all the more like a comfortable retreat. A New York mob story, with Robert De Niro and Joe Pesci? Easy. Scorsese had explored this world previously, in 1973’s Mean Streets, a movie about the pathetic lives of low-level hoods. And in a way, Mean Streets was an expansion of his 1967 debut feature Who’s That Knocking At My Door, where the criminal milieu was merely implied. Goodfellas is more sweeping, though, more overt, and more explanatory. It’s an adaptation of Nicholas Pileggi’s non-fiction book Wiseguy (with a Pileggi screenplay), given the breakneck pace of Raoul Walsh’s 1939 underworld history lesson The Roaring Twenties. 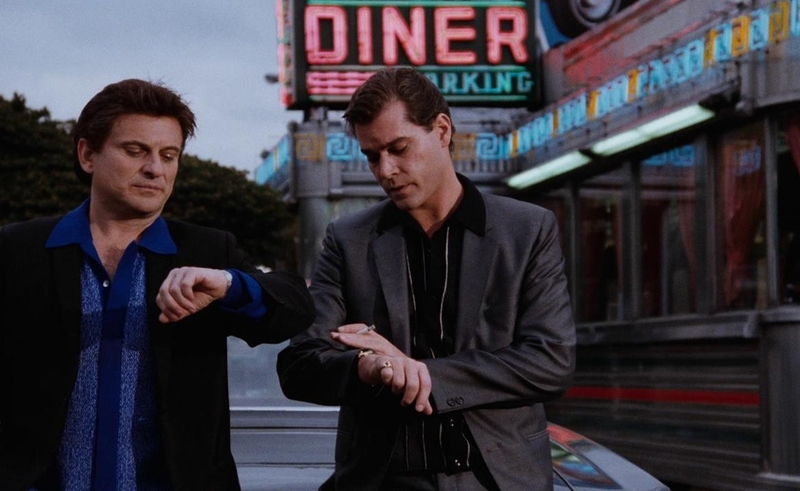 Though it wasn’t intended as a prestige picture, Goodfellas does cover roughly 30 years in the life of real-life mobster Henry Hill (played by Ray Liotta), and doubles as a study of how the mafia changed between the 1950s and 1980s. Where Scorsese’s friend Francis Ford Coppola similarly used narrative to frame of American mythology and allegory in his Godfather series, Scorsese thought smaller, approaching Goodfellas with pulpy old Warner Bros. “crime doesn’t pay” movies and raw, improvisatory John Cassavetes indies in mind. As a result, a lot of what makes Goodfellas a perennial favorite happened by accident. Thelma Schoonmaker’s machine-gun editing and Michael Ballhaus’ rapidly swooping cinematography were intended to be solutions to a problem: a way to handle the story’s info-dump without boring the audience. (Both Scorsese and Schoonmaker later expressed some dismay that Goodfellas fans expected every one of their subsequent films to use the same gimmick, whether it fit the material or not.) The casual humor and feeling of camaraderie—the hangout vibe that makes the movie such a pleasure to revisit—emerged from Scorsese’s decision to fill the cast with actors he knew and trusted, then let them just be. There’s no moralizing in Goodfellas. These characters are obviously dangerous, self-deluded people, but Scorsese was more interested in what they were when they were just sitting around their kitchen tables, being relatively ordinary. Goodfellas’ influence on American popular culture wasn’t necessarily immediate, but it didn’t take long for it to become pervasive and profound. The emerging generation of independent filmmakers in the 1990s (such as P.T. Anderson and Quentin Tarantino) embraced Scorsese’s stylistic bravura, as did any number of Hollywood hacks who knew how to copy it, but not why. Meanwhile, stories about the everyday lives of criminals became more commonplace, culminating in the HBO hit The Sopranos, which picked up on Goodfellas’ theme of organized crime as a deadly variation on a soul-sucking corporate job. And Scorsese himself has made multiple Goodfellas companion pieces over the past 25 years, including Casino, Gangs Of New York, The Departed, and (arguably) The Wolf Of Wall Street. But while all those Scorsese films are good-to-great, none of them are Goodfellas. There’s an effortlessness to this movie that would be hard for anyone—even its auteur—to recreate. So much about it is counterintuitive, from the wall-to-wall voiceover narration (usually frowned upon in a visual medium) to the relegation of De Niro and Pesci to supporting roles. Both those choices make a huge difference. Liotta’s narration—supplemented by Lorraine Bracco, playing Henry’s wife Karen—fills in the larger picture of criminal life that Scorsese left out of Mean Streets, giving Goodfellas a satisfying comprehensiveness. And by moving De Niro and Pesci to the edges of the picture, Scorsese forces viewers to identify with Liotta’s Hill, an insider who feels like an intruder, eclipsed in power and personality by his closest friends. That sense of access—of being admitted to places where regular folks shouldn’t be—is still the biggest reason Goodfellas is so popular. Scorsese had humanized violent men before, exploring their guilt, temptations, and petty redemptions. But Goodfellas openly conveys the pleasure of excess in the way movies like Mean Streets, Taxi Driver, and Raging Bull don’t. It’s visually exciting, off-handedly funny (full of quotable lines like, “You learned the two greatest things in life: Never rat on your friends, and always keep your mouth shut.”), and genuinely informative. Goodfellas invites audiences in, then won’t let them leave. Goodfellas has been released on Blu-ray twice before, in editions widely criticized for their poor picture quality. The new 25th-anniversary BD is a clear improvement, with a 4K, Scorsese-approved remaster. Extras-wise, this set mostly re-collects everything from past discs, but that’s nothing to complain about, given that the older Goodfellas bonus features are pretty great. The upgraded edition contains two commentary tracks: a compilation of observations by Scorsese and several of his key cast and crew members, and a sparse conversation between Hill and an FBI agent. This version also carries over the feature-length documentary Public Enemies: The Golden Age Of The Gangster Film, which mentions Goodfellas briefly as part of a larger historical/analytical discussion of the genre (complete with scholars smartly quoting an influential essay on gangster pictures by critic Robert Warshow). The only significant new addition to this Goodfellas is a 30-minute documentary produced by Brett Ratner’s RatPac Entertainment, in which some of the people who worked on the film and longtime Scorsese collaborators like Leonardo DiCaprio and Harvey Keitel weigh in on the director’s open creative process and his keen-eyed fascination with human misbehavior. This new doc is fine in and of itself, though there’s very little in it that’s not in the commentaries or in the earlier DVD featurettes. It’s fascinating primarily as a point of comparison to those prior retrospectives, where everyone looks younger—and where directors Joe Carnahan, Antoine Fuqua, and Frank Darabont are trotted out for their “famous fan” opinions. It says something about the quality of a film when its behind-the-scenes featurettes look more dated every year, while the movie itself remains timeless.